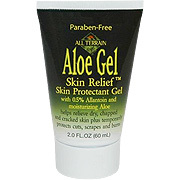 All Terrain Aloe Gel skin Relief is a highly effective, paraben-free natural first aid skin protectant to protect burns and help relieve dry, chapped and cracked skin. Promotes the healing process from minor burns, skin irritations and dryness. High quality aloe (10% polysaccharides) plus traditional healing herbs. Inactive Ingredients: Aqua (Water), Aloe Barbadensis (Aloe Vera) Gel, Glycerin, Dimethicone, Dehydroxanthan Gum, Sodium PCA, Anthemis Nobilis (Chamomile) Extract, Cucumber (Cucumis Sativus) Extract, Bisabolol, Polysorbate 20, Phenoxyethanol, Caprylyl Glycol, Lavandula Angustifolia (Lavender) Oil. Aloe Gel Skin Repair is shipped in a discrete, unmarked package. Orders are processed immediately and usually take about 3 to 5 working days to be received. We do ask that you try it for 2 to 3 weeks to feel the full effects. Any information received is used only for order processing and shipping purposes. Your information, such as e-mail address, will never be disclosed to a third party.